I took these pictures over the past week just up the street from my house. The signage should give you a good indication of what happened to a 14 year old girl last Monday. On my way home, I saw police cars, a stopped truck and everything blocked off. When you have a family, this means despite all reason to suggest that everything is ok with your family, you risk stitches, muscles cramps, overheating and general exhaustion to get home as fast as you can and see your wife and kid in tact. Not this time. This particular street has somehow developed a culture of seeing pedestrians as hurdles to jump over on the way home to supper. Just about everytime I’d walk to the grocery store with my 3-year-old son, I’d watch car after car just completely ignore the fact that I am there — with a 3-year-old — waiting to cross the street. Everytime this happened, I got to feel like I swallowed a canteloupe whole because I would be imagining what would happen if my son ran out into the street, as 3-year-olds are apt to do on a particularly cranky day. Oh the driver was over 80 — should we be re-testing older adults? I don’t really care. The broader point is that this 80-year-old was doing just about what ever second other person was doing. Perhaps the guy/girl had a little less of a reaction time — sure, but if he drove slower to compensate for this, he’d probably be honked at by some jerk who wanted him to drive faster. Ultimately the responsibility for a pedestrian’s safety falls on the pedestrian. 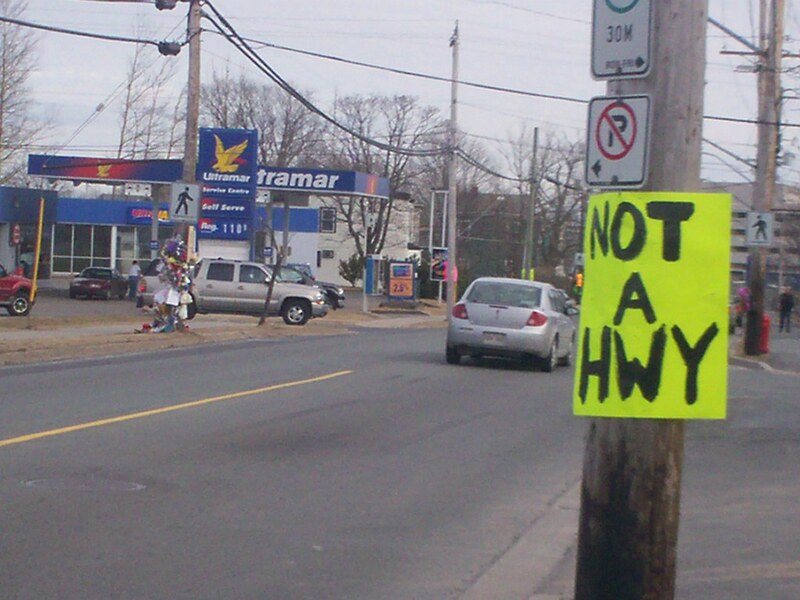 To an extent — sure, you have to look both ways. Sure, you shouldn’t just walk out in front of someone. But let’s really talk about responsibility here. I was born with two legs for walking — you’d be hard pressed to find a law that would deny someone the priviledge to use your feet. Driving is a priviledge, one that is bestowed on the basis that people will do so responsibly. The more we think about driving as a necessity, the more we get communities built around the idea of a one-hour commute to just about everything: groceries, work, entertainment whatever. Driving is a convenience — not a necessity. And the cost of that convenience is to — once in a while — stop for the occassional pedestrian trying to cross the street. We need fancy-schmancy technologies to prevent this from ever happening again. It seems to me that the friends and family of this 14-year-old has the technology just right. There’s another sign here that says “look both ways.” The technology is just simple community understanding and, heck, moral reasoning. I don’t care if there is a count-down or flashing yellow lights or whatnot. The broad point here is that failing to stop for a pedestrian puts people’s lives at risk. That is immoral, unethical, — just plain wrong, even if no one gets hurt in the process. The cost of lives in the cases where a disaster does occur. The cost of these newfangled technologies meant to keep people from getting hit. The costs related to the fact that I have just one more reason to lock my kid up in the house, instead of letting him play outside. Yes, pedestrians have to do their part. Having a healthy sense of paranoia about being hit by a car is a good thing. Although I can give you examples where I was given the finger for making damn sure that every car stopped before I crossed. There are bigger problems here as well, caused by little things. The fact that our cars all have air conditioning mean that we keep our windows closed. That brings us just that much further away from realizing that there are communities sitting outside that windshield — with people who eat, sleep, love, live and die all the time. It’s time that drivers and pedestrians started to regain the connections — however strained — that were, at one time, so commonplace.